YouthBuild USA’s Helene D. Stoneman Scholarship and Civic Leadership Program grants $2,000 to outstanding YouthBuild graduates to assist with their college education. Selected graduates demonstrate excellence in civic engagement, community leadership, and academic achievement. We are happy to announce that the following YouthBuild Philly alumni were recently awarded 2013 Helene D. Stoneman Scholarships: Shanna Fields, Tyrik Gass, Amika Miller, Jasmine Myers, Ashanti Stafford, Zurrell Toney, and Domonique Williams. Class of 2013 graduates Keyzett Brockington-Ham, Dominique Brown-Rasley, Damia Darrah, Yaz’myne Hicks, and Joshua Nelson recently finished up up their Fall 2013 semester at Community College of Philadelphia! We congratulate them on completing their first semester and wish them luck in the spring semester. Chazz Bonds ‘13, Danielle Mays ‘13, and Kadiejah Williams ‘13 have been attending classes at CCP and working part-time throughout the Fall 2013 semester. 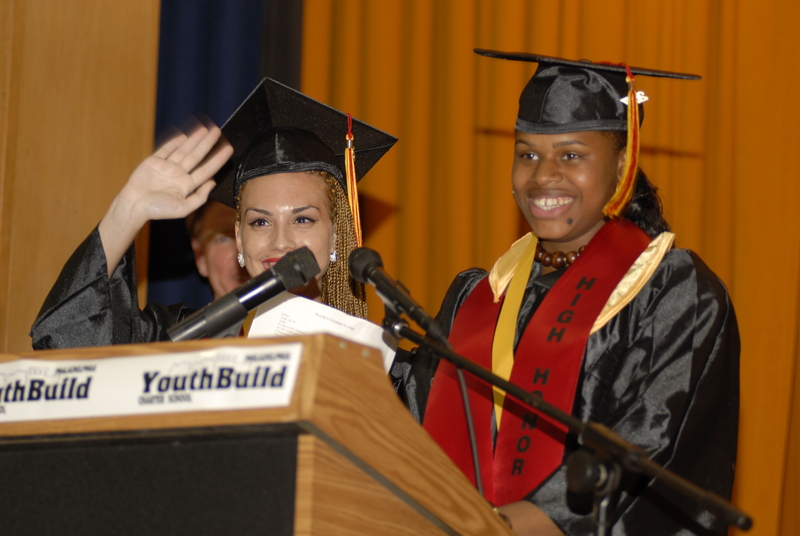 Analicia Lindsay-Whitehead ‘07 (pictured, right, at her 2007 graduation ceremony) recently joined the Program Committee of YouthBuild Philly’s Board of Trustees. She also delivered the alumni address at the Class of 2013 commencement ceremony in August, advising graduates to “be unstoppable.” Analicia recently enrolled at Villanova University to pursue a Master’s Certificate in Project Management.